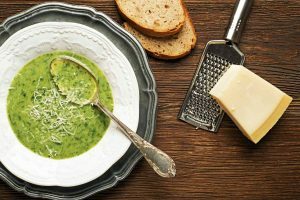 A bowl of asparagus soup isn’t complete without parmesan. It’s January, and the snow continues to fall throughout the Northern Hemisphere, from the peaks of the Swiss Alps to the farmlands of the French countryside. Winter in Europe may be a beautiful time, but cold, inclement weather can create hazardous conditions for tourists and locals alike. Warm up with one of these traditional European dishes! Italy is subject to a variety of different climates, but those living in the northern cities, such as Milan, experience frigid temperatures each winter. Soup is a popular winter dish in Italy, particularly Zuppa di Asparagi (asparagus soup). The cream-based soup is traditionally enjoyed before a meal and served with a healthy portion of fresh parmesan. Boeuf Bourguignon is the ultimate French comfort food. Traditionally prepared with red wine, cognac, fresh herbs, vegetables, butter, and beef chuck, this hearty stew warms both the body and soul. There are many different versions of this classic recipe, but it’s almost always served with a large portion of creamy mashed potatoes to compliment the gravy mixture. Germans love their beer almost as much as they love pork. Enjoy the best of both worlds with a hot serving of Schweinebraten, a traditional pork roast made from broth and dark beer. Traditionally finished with fresh thyme and potato dumplings, Schweinebraten is frequently served in Bavarian beer halls. The winters in La Rioja, Spain can be incredibly cold, but a variety of rich meals cooked in wine can quickly warm you up. Pollo a la Riojana is made with white wine, garlic, red pepper, and chorizo and cooked down to create the perfect cold-weather stew. This savory dish is commonly served with patatas fritas (french fries). AESU offers several trips to Spain, including Euro Explorer, Discover Spain, and Continental. Explore Spain and its spectacular landscapes. Try a variety of authentic Spanish dishes! This entry was posted on Wednesday, January 17th, 2018	at 9:42 am	. You can follow any responses to this entry through the RSS 2.0	feed. Both comments and pings are currently closed.